A masterclass first-half from Manchester United, featuring a first goal for Paul Pogba, was more than enough as the Red Devils cruised past Leicester City at Old Trafford. 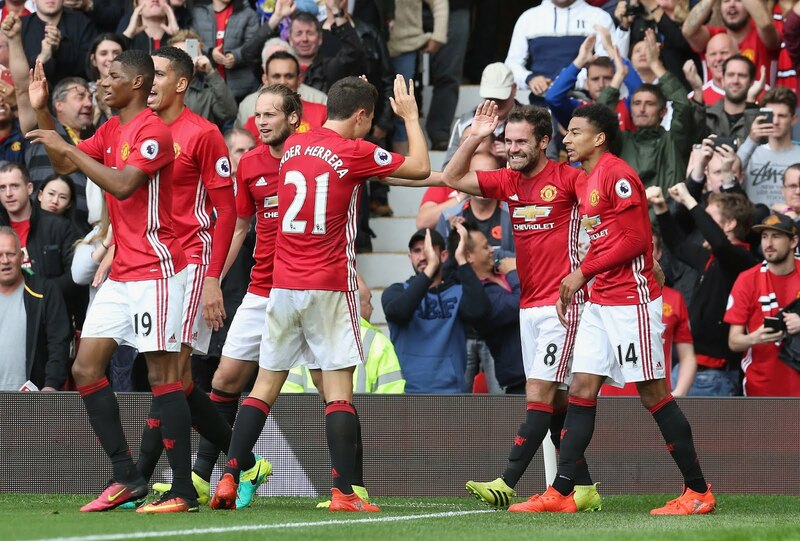 Captain Chris Smalling opened the scoring by heading in Daley Blind's cross, kickstarting an exquisite first half from the Red Devils. 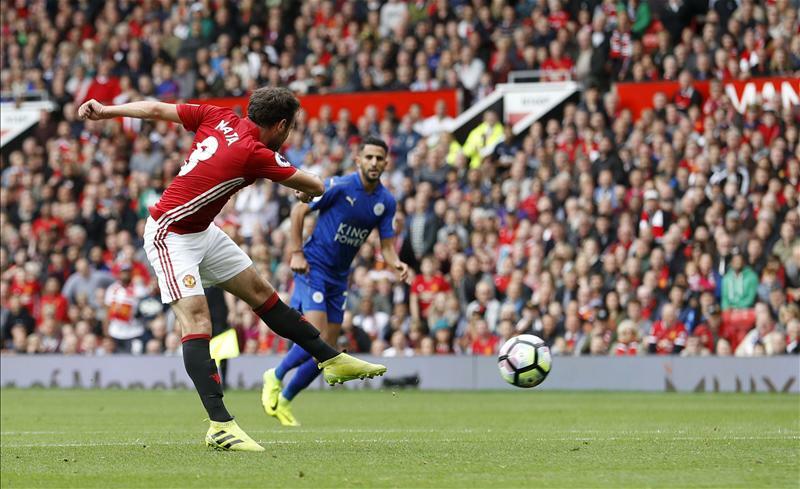 Following suit was Juan Mata, netting an excellently worked goal, before Marcus Rashford made it three with a simple finish. 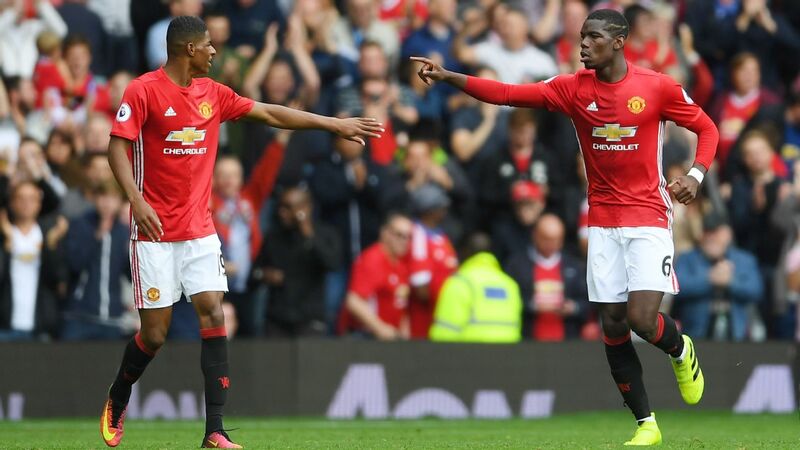 Paul Pogba bagged his first goal upon his return to Manchester United to cap off the 45 minute period, meeting a corner with a thumping header as the champions were outclassed. Demarai Gray did manage to peg one back for the Foxes with a stunning strike, although it would be a mere consolation as the United basked in glory. Old Trafford was an anxious backdrop on a warm lunchtime in the north west of the country, with team news indicating that captain Wayne Rooney had been dropped following a poor spell of form. The red faithful in attendance would have been somewhat pleased with the start made, as Marcus Rashford was a lively bundle of energy down the left wing while Ibrahimović's ambitious volley was off the mark. Daley Blind blazed over as the Red Devils settled in well with a substantial chunk of possession. However, it was nothing worthy of grabbing the game by the scruff of its neck, with the Foxes instead growing. David de Gea beat Slimani to a cross right before Bailly cut out a promising ball, balancing things up after a goalless quarter of an hour. Marc Albrighton scuffed his attempt as he shot off target towards the far post following a series of blocks, continuing to mark Leicester's territorial advancements in the game. Things wouldn't follow that exponential route, though, as a corner to Daley Blind would subsequently put Mourinho's side in front. The Dutchman whipped in a menacing delivery, flying over Huth and Morgan towards the stand-in captain for the day Chris Smalling, knocking a low header comfortably past the keeper and relieving the tensions around the ground. It was poor defending from the Foxes, who were unable to pick up him or Pogba who patrolled the area at the time - and they were paying the price. Not only were the home side now in the lead, they also had the wind firmly behind their sails. Zlatan Ibrahimović ran on to a ball down the left before knocking it across to Rashford, with the keeper to beat towards the right. The youngster's first touch made things hard, making a hash of it as he smashed into the stands. Moments later, his overhead kick attempt floated over the crossbar, as fans roared on with the lead looking to be extended. Paul Pogba was also looking well up for the occasion now, almost producing a mouthwatering goal as he lofted the ball over the defensive line to Ibrahimović, for a volley which whistled off-target. Spurred on by the home fans, the most expensive player in world football then let fly with a menacing piledriver from long-range, parried away by Ron-Robert Zieler. Some delightful interplay would then lead to a second goal, as Juan Mata started and finished a fine move. 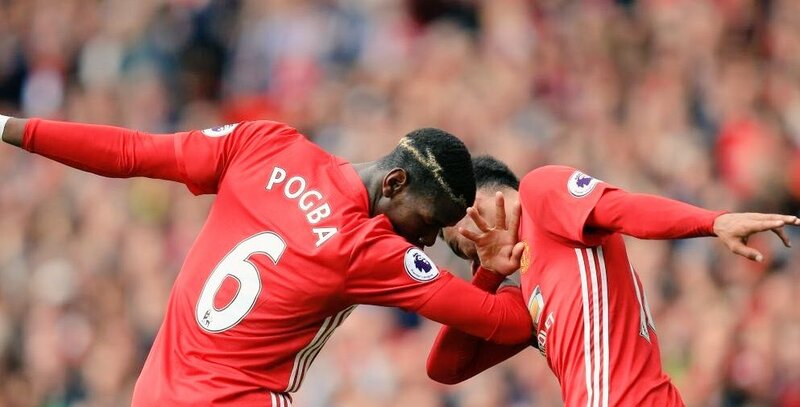 Pogba flicked on his initial pass to Lingard, who rolled it across for the Spaniard to rifle towards the far end of the goal, with the champagne now on ice as they revved up the style. 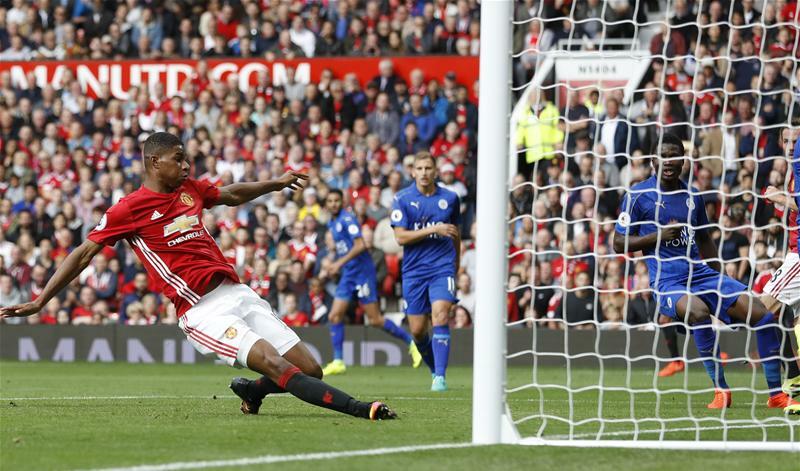 Marcus Rashford would soon be rewarded for his persistence, bagging his side's third goal. With Leicester City players falling asleep, Blind caught them out with a low cross towards the near post which was passed on across the face of goal by Mata to Rashford, blasting into an empty net and sealing the deal with plenty of time to spare in the first half. Chances continued to tumble and then Pogba's wait would come to an end. 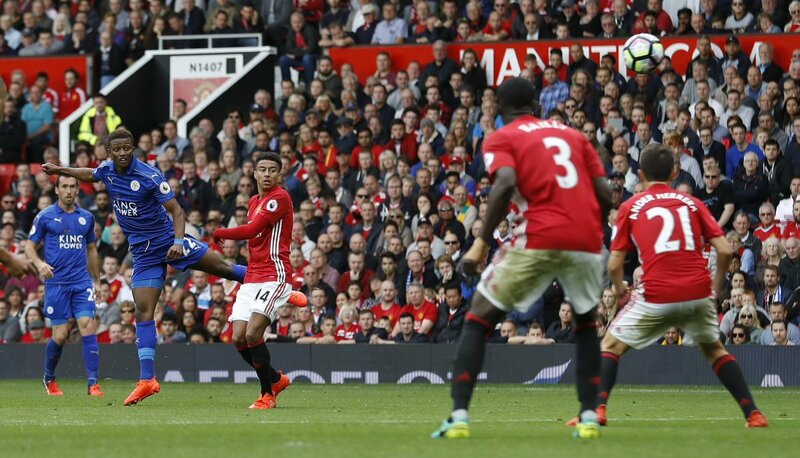 The French superstar scored his first goal in his return to the club, rising high to meet Daley Blind's corner. He had finally made his long-awaited mark as many had hoped, having an instrumental role throughout the contest and stamping it by opening his account. 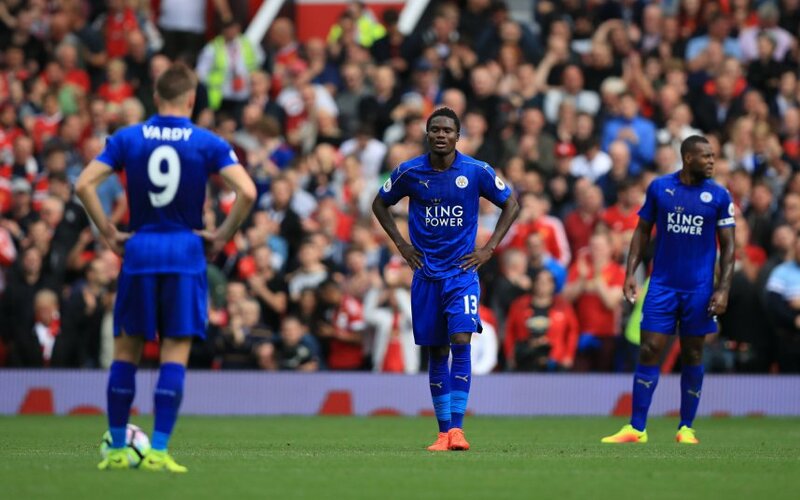 At the whistle, Leicester City's shoulders slumped as their dejected squad headed for the tunnel. While their opponent's superiority had evidently shone through, they could have been accused of being far too pedestrian. Riyad Mahrez and Jamie Vardy were substituted to start the second half, with Ranieri accepting defeat and looking towards their Champions League clash in the coming week. The Foxes weren't at all giving up though, still pressing with the hope of preserving their pride. That game plan worked out well for the most part, with 60 minutes of play nearing that had kept things even. Demarai Gray gave something for the travelling supporters to cheer about when he beat de Gea with a sumptuous shot, working around his defender to unleash a lethal strike into the far corner, leaving the Manchester United keeper with no chance of stopping it - quite the souvenir after he came on for the second half. He'd try his luck a little later on too, although it was stopped well on that occasion. Zlatan Ibrahimović's attempt ran just wide on a counter soon after, while Lingard couldn't threaten. At this stage, with the points wrapped up, it was more of an experimental bit of work; even with the champions trying to chip away. They could've, with Andy King's tame shot rolling towards de Gea. The hosts' weren't getting complacent, just less stringent. With Wayne Rooney on in the closing stages of the game, Ibrahimović registered another attempt, but would be denied of getting in on the act. United embraced possession and coasted to the full time whistle.